"Actually, we are just six miles from foodie Ludlow, but hidden down mazy country lanes this handsome huddle of one-time farm buildings certainly feels remote." 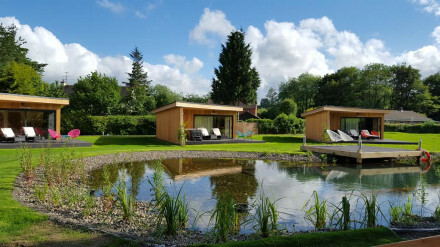 "Escapist, romantic, and tranquil: this is a place of quiet sophistication, where you can luxuriate in the calm of the Shropshire countryside." "In keeping with Ludlow’s latent foodie traditions, it also hosts an acclaimed restaurant, atmospherically housed in a grand Norman hall, where chef Karl Martin prepares different tasting menus every night from Tuesday to Saturday – inventive seasonal affairs using local produce that are excellent value at £40–£50 a head."